w h o a r e w e ? ? ? Antigravity was first conceived in 1998 by writer, philosopher Brad Fenwick, and artist, political activist DINAC whose musical vision was inspired by progressive rock music, conspiracy theories, and science fiction. In early 2000, the guys met up with guitar wizard, keyboard player Basil Ganglia and the newly formed band soon began performing their trippy brand of prog rock at local Winnipeg haunts. The recording of their debut concept album "Annuit Corruptus" got underway with Chris Conlin of Laundry Mat Studios in early 2001 and was to develop into an epic tale over the next few years. In the summer of 2002, DINAC left Antigravity to pursue his art and Paulette LaFortune of Sweet Spot Productions began managing the band. By the end of the year, multi-instrumentalist, artist Peter Baureiss was recruited as the full-time beatkeeper to round out the band's current line-up... and the power trio was born. In March of 2003, in an effort to raise some money to fund the completion of "Annuit Corruptus", Brad and Basil decided to sift through Antigravity's archives and the result was the release of the first in a series of never-before-heard live recordings of improvisational jams Phlogiston I. The disc was released under the band's newly formed label Progspiracy Music. As time passed, Antigravity realized that the undertaking of recording and writing a concept album was a much bigger task than anticipated as well as one that was important considering its scope and subject matter. The band wanted a sound that reflected the nature of the ideas, lyrics and music on the CD and so decided to revisit the original recordings of "Annuit Corruptus" over the summer of 2003. The services of Howard Klopak of Groove Jungle Recording Studio and Allen Hunnie Audio Inc. were enlisted to remix and master the entire album. 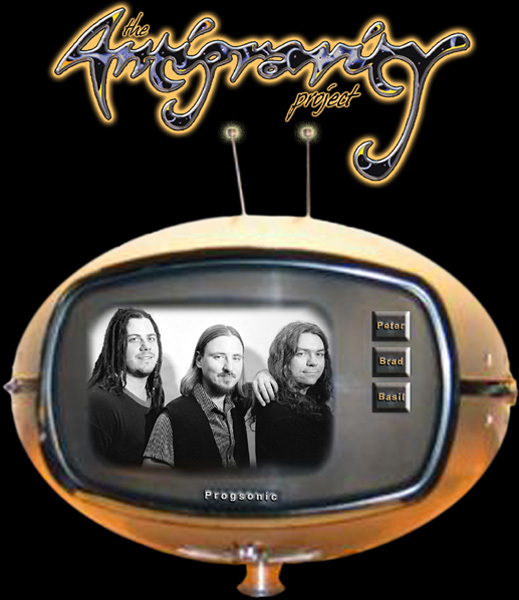 The band also decided to change its name to 'The Antigravity Project' and on September 26th, 2003, "Annuit Corruptus" was released with an art music concept video co-produced by Sweet Spot Productions and local video collage artist Richard Altman in true prog rock style. With a two-story movie screen behind them and guest violinist Kristjanna Oleson and didgeridoo player Jason McLean, TAP wowed enthusiasts at the 1st Annual Autumn Art/Music Expo at the Ramada Entertainment Centre in downtown Winnipeg. Since then, the CD has had favourable reviews by The Winnipeg Free Press, The Uptown, Stylus Magazine, The Winnipeg Sun, and the Uniter. "When The Moody Blues released Days of Future Passed in 1967, it signaled the birth of a delightful little genre known as "prog" rock. During the golden years of prog, bands like King Crimson, Yes and the Mothers Of Invention made a living by crafting epic albums with 10 minute guitar solos and experimental instrumentation based on classical scores. By the 80s, it had all but disappeared from the musical landscape. Enter Winnipeg's Antigravity Project. With conspiracy theories on the mind and multiple instruments in their hands, the boys in The Antigravity Project have managed to record an album that would fit in nicely with Dark Side of The Moon and Red... While Annuit Corruptus is fantastic, brilliant rock, the band puts on an even better live show." John Symons, The Uniter. Jon Symons was so impressed with TAP's live show, that he recently named the band's show at The Royal Albert Arms on January 17th, 2004 as one of the top 5 live shows of 2004 in Stylus Magazine placing third between R.E.M. and Metallica!!! Over the next few years, Progspiracy Music plans to introduce The Antigravity Project to international markets including prog rock radio and websites worldwide in the hopes of performing at one of the many world renowed festivals in the US and Europe. Other projects on the horizon... the band will be releasing a single and video on DVD co-produced by Brad Fenwick, Sweet Spot Productions and Richard Altman called The Story of Metronomicon. Fans in Winnipeg had a chance to see a sneak preview at the 2nd Annual ArtSonic Art/Music Expo back in October 2004. While The Antigravity Project plans to release another studio album of epic progressive rock songs like "Babies On The Moon", "Metronomicon", and "Shoulder of Orion", some of their newer material would be considered straight ahead rock and roll like "Rock Star Crap" and "What You Don't Know". Their funky jams on songs like "Life Is Like That" (lyrics written by Paulette LaFortune of Sweet Spot Productions), are an integral part of their current live show and are reminiscent of the early exploration by the original line-up into 'jam land' which spawned 'Phlogiston I'. Recording projects for the future... the possibilities are endless. For now, the band is recording a demo and focussing on playing out as much as possible. The music is a dramatically arranged fusion of rock, jazz, classical, funk, world, eastern, and blues genres that takes unexpected stops, turns, and tempo shifts. The lyrics on their debut album Annuit Corruptus are best described as "bizarre" and "satirical". They touch on topics that are traditionally not covered by mainstream media such as government corruption, secret societies, UFO and alien cover-ups, the destruction of the planet, and humankind's fight against oppression. The live shows incorporate elements of visual multimedia and performance art sometimes involving costumes and props and other times encouraging audience participation. The underlying message is one of positive action and respect for each other and the planet. Antigravity strives to amuse and inspire and will take you on a unique tour of their universe in search of the truth. "The Antigravity Project: an amalgam of rock, jazz, classical, funk, and world, from visual multimedia to performance art and satire. Delving into the bizarre world of conspiracy theory, visiting science fiction themes, pondering humanity's many follies, and ultimately challenging us all to look deeper within and without."